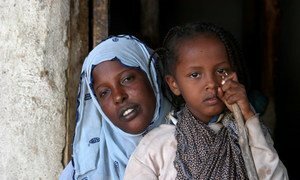 At age one, Fatima was subjected to female genital mutilation/cutting (FGM/C) in her village in Afar Region of Ethiopia which has one of the world’s highest prevalence rates. While the majority of people in countries where female genital mutilation/cutting (FGM/C) is concentrated oppose this harmful practice, there are still 30 million girls at risk of being cut in the next decade, according to a report launched today by the United Nations Children’s Fund (UNICEF). The report points to a gap between people’s personal views on FGM/C and the entrenched sense of social obligation that fuels its continuation, exacerbated by a lack of open communication on this sensitive issue. There are currently 125 million girls and women alive today who have been subjected to FGM/C, which refers to a number of practices which involve cutting away part or all of a girl’s external genitalia. The practice – recognized globally as a violation of the human rights of girls and women – has no health benefits, causes severe pain and has several immediate and long-term health consequences, according to UN agencies. The report’s surveys found that not only are most girls and women against the practice, but that a significant number of men and boys also oppose FGM/C. In three countries – Chad, Guinea and Sierra Leone – more men than women want the practice to end. It recommends opening up FGM/C to greater public scrutiny, to challenge the misperception that “everyone else” approves of the practice. It also highlights the role education can play in bringing further social change, noting that higher levels of education among mothers correspond to a lower risk that their daughters will be cut and that while in school, girls may develop ties with others who oppose FGM/C. As new data points to fewer girls being subjected to female genital mutilation/cutting (FGM/C), United Nations agencies today called on countries to accelerate efforts to eliminate this life-threatening practice.